iPad Pro vs iPad Air 2: Which One do You Prefer? 2017 10.5-inch iPad Pro vs iPad Air 2: Which iPad Suits You Better? Obviously, 2017 is the 10th anniversary of iPhone and Apple again sets the world on fire with its world-awaited iPhone 8/Plus, as well as the bigger iPad Pro, which is finally available in Autumn, 2017 and has been widely regarded as an ultimate solution for Apple compete in the ever more saturated tablet market. This is why scores of guys say the fall gonna be Apple's harvest season. Now that Apple places such high hopes on iPad Pro, I believe this 2017 new tablet has no reason to let us down, compared with its previous model iPad Air 2. So for those genuine Apple fans, if you have an urge to bring a new iPad to home, wait a second! After I compare this iPad Pro with iPad Air 2, you will have a better understanding about the iPads and then you can make your own decision. Also check 2018 new iPad vs iPad Pro. • 5KPlayer-100% free AirPlay receiver & sender for iPad Pro/iPad Air. • 1:1 stream videos from iPad to Mac/PC with 4K, 1080P, 720P, MP4, MKV, MOV videos. • Wirelessly AirPlay music MP3 AAC from iPad to Mac/Windows PC as AirPlay speaker. • Also stream video music from Mac/Windows to Apple TV for watching with family. Admit it or not, the screen of a tablet is something that always needs refining. When you plans to buy a tablet, your first impression counts so much on the tablet's screen, which is the key point to decide whether you wanna further know this tablet or not. So to compare iPad Pro with iPad Air 2, let's get it started with their display screen. iPad Air 2 packs in a 9.7-inch screen, with the type of LED-backlit IPS LCD, capacitive touchscreen and 16M colors. Upgraded to 1536 x 2048 pixels (~264 ppi pixel density), pictures really come alive when viewed on the iPad Air 2, markedly so compared to its predecessor. What else is worth to mention is that the compressed screen reduces reflectivity a lot, and it's a satisfying step forward on the screen front. Compared with iPad Air 2, iPad Pro is still hard to give a 100% answer about its screen. It comes in with two models, 10.5-inch and 12.9-inch display, with the resolution of 2732 x 2068 (265 ppi), which can be accompanied with a full-sized keyboard. Talking about iPad Air 2 design, the first thing striking you is its slim body. With 6.1mm thick, iPad Air 2 effortlessly becomes one of the slimmest tablets in the current market. The iPad Air 2 is a complete package, smooth and easy to hold in one hand. And its body only weighs at 437 g or 444g so that you would not feel uncomfortable to hold it even for several hours. 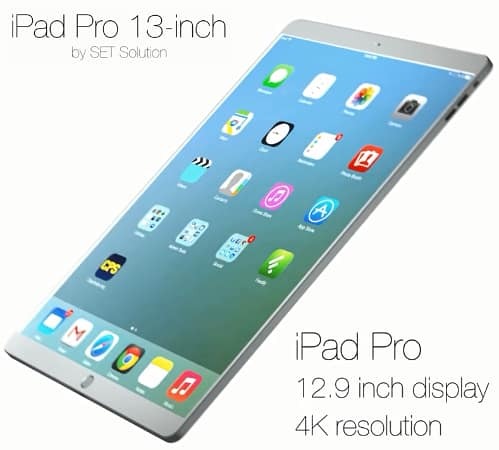 According to official details, iPad Pro measures 305.31mm x 220.8mm x 6.9mm, a little heavier than iPad Air 2. Assisted by Apple A8X chipset, iPad Air 2 is designed to offer you with a screamingly fast operation. It's nearly 40% faster than the competition, including the iPhone 6 and 6 Plus and all the other top smartphones. Also shipped with Triple-core 1.5 GHz CUP and the latest iOS 8 operating system, iPad Air 2 delivers a high performance for iPad users to enjoy entertainment life or something else. If you think iPad Air 2 is already perfect, please hold your horses. One of the main iPad Pro advantages is its outstanding performance. The new iPad ships with A10 processor, 2-4 times faster than A8X. And its GPU performance wins high scores from the experts that can be on par with the desktop computer like MacBook Pro/Air. Speaking of iPad Air 2 battery life, it's inevitable to mention that some of that incredible 6.1mm thinness has come by reducing the size of the battery. It's gone from 8,600mAh to 7,340mAh in the iPad Air 2. Apple claims that battery life hasn't dropped because it's made key improvements to the efficiency of the processor. The result of our trial shows that iPad Air 2 can actually last almost 10 hours talking time as its advertisement says. How about iPad Pro's battery life? Maybe that's your focus. Detailed information shows that it sports with an 11,000mAh battery to dramatically improve battery life. Specific data on the right side picture. On top of the upgrading on features and performances, there are also the new points coming to iPad Pro. The first one is the tangible external keyboard, which can be connected via magnetic force, similar to Surface Pro 3. And it has the capability to automatically decide to launch the virtual keyboard or the tangible external one. The second one goes to the Pencil. You might think of the pencil used in Samsung Galaxy series. 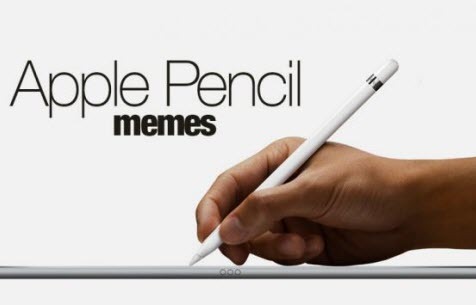 But this time, Apple utilizes Pencil, which empowers you to take easier control on your operating on the tablet, catching press, click, inclination, tip and more gesture. This pencil can constantly work several hours and also directly charge battery on iPad Pro. After side by side comparison between iOS 11 iPad Pro and iOS 8 iPad Air 2, I bet you already have a comprehensive about these two tablets from Apple. It's unwise to make an unilateral judge on which one is better, for the best one is not always the optimum choice for you. Your choice should come down to your own needs. If you need an all-in-one tablet with moderate cost, then iPad Air 2 is your second to none choice. In case you are the one who devote yourself in collecting the latest handheld devices and cost means nothing to you, then you have no reason to miss the flagship iPad. No matter which one you are keen on, it's no extravagance to say both iPad Pro and iPad Air 2 are the must-have device for you to watch DVD or videos thereon with large screen and sharp image guaranteed. Yet, the question is that all iPads are purely compatible with MP4, MOV, M4V formats, which means you would encounter failure when playing DVD movie or video in MKV, AVI, FLV formats. See the most suitable iPad Pro supported video formats. Play DVD Movie/Videos on iPad Pro or iPad Air 2, How to Make it Happen? 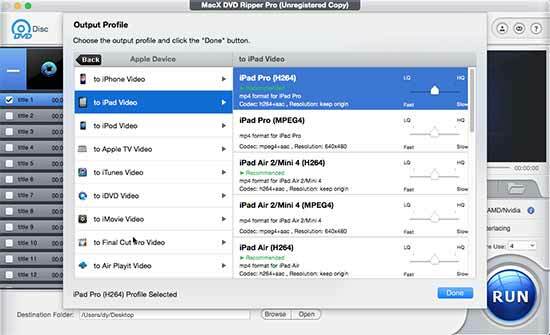 In a bid to smoothly playback any DVD movie, video on iPad Pro/iPad Air 2, what you need is the professional yet solid DVD ripper and video converter. Needless to look around, here the award-winning MacX DVD Ripper Pro is the very one to help you playback DVD movie without breaking much of sweat. Infused with the advanced DVD decryption tech, this high-end DVD ripper software can 1:1 copy any DVD movie to iPad supported video formats, no matter the DVD copyright protected by Region Code, CSS, or Sony ARccOS, Disney X-project protection. How about playback YouTube video, camcorder HD video MKV, AVCHD, MTS or some other online FLV, 3GP, AVI, WMV videos? No bother! The world-renowned MacX Video Converter Pro can realize your dream, which instantly makes itself a household name with its unrivalled knack to convert any video (SD or HD) to iPad Pro/Air 2/iPad Mini 4 accepted MP4, MOV, M4V, as well as MKV, AVI, FLV, MP3, AAC, iPhone Ringtone, etc. with world's fastest speed and 98% quality reserved. What are the 2017 iPad Pro advantages and disadvantages? Here the top pros and cons of iPad Pro are introduced to help you know better about the strengths and weaknesses of this new iPad. In the fight of 2017 iPad Pro vs Surface Pro 4, which is more suitable for your needs? Here we compare Surface Pro 4 and iPad Pro in detail to help you decide whether to buy Surface Pro 4 or iPad Pro. Should you upgrade iPad Air 2 to iPad Air 3? What're iPad Pro advantages? iPad Air 3vs iPad Air 2 comparison tells all the features, release date, price, advantages and disadvantages of iPad Air 3 over iPad Air 2, in a bid to help you make a worthwhile purchase between new iPad Air 3 and discounted iPad Air 2. 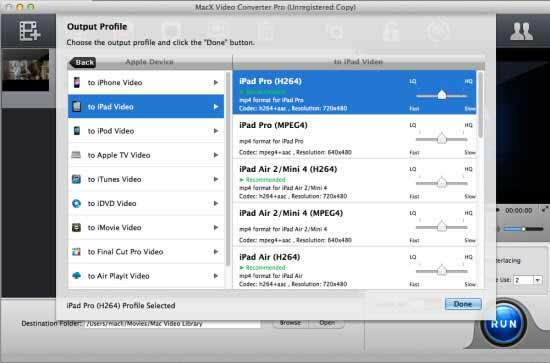 MacX Video Converter Pro is an all-in-one video converting to download & convert videos to iPad Pro, iPad Air, iPad Mini 4, etc. with World's No.1 fast speed.